Soak rice for 30 minutes. On a full flame, heat water. Add cumin seeds, bay leaf and salt. Boil. Add rice and lightly stir. 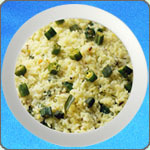 Cook rice completely, strain and keep aside. Heat oil, add mustard seeds and chopped onions. Sauté till translucent. Add ground items, curry leaves, green chilli and fry for 2 minutes. Add chopped tomatoes and sauté for 3 to 4 minutes on a low flame. Then add turmeric and red chilli powder. Add bhindi and salt, and sauté till the bhindi is cooked well. Add cooked rice, switch off the flame and mix well.